I'm playing with an idea but am running into limitations in my ability. Anyway, I'm going to keep tinkering with it. I've thought about this too. The aliasing is probably due to the bajillion switches and how Audulus doesn't always scan inputs at audio rates. That said, the patch sounds good and I'm really curious how you are able to generate audulus patches code. Did you backwards engineer the code or something? 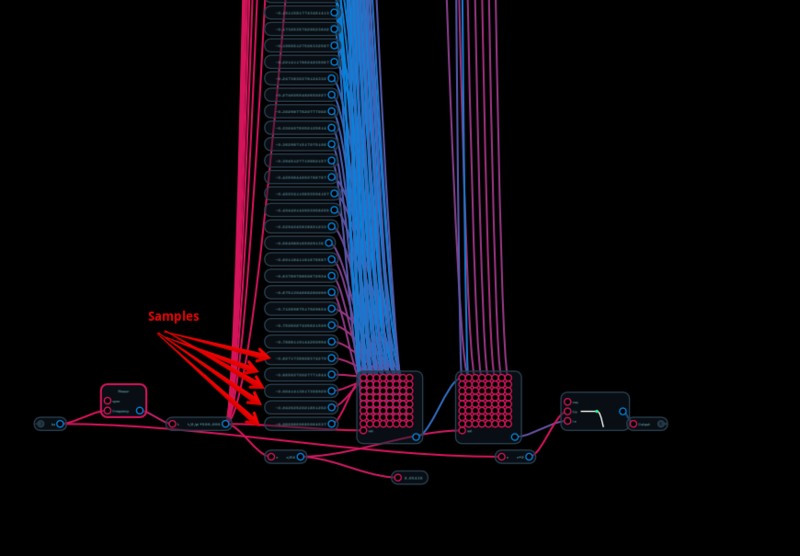 The key pieces for the wavetable part are audulus.rb and build_wave_table_node.rb (both written in Ruby). I did reverse engineer the Audulus patch format, which as of Audulus 3 is straightforward and pretty easy to work with. This is massively insane and I'm soooo glad you wrote code to write it for you lol I thought at first you did each one of these samples by hand! And yeah it's aliasing like a mofo but it also sounds awesome. I've played with a few things to get rid of the aliasing, but so far nothing has worked. My understanding has increased, though.. Gibbs phenomenon really has nothing to do with it, or at least a lot less than I thought. I've tried by downsampling the WAV to a power of 2 (512 samples), then skipping samples as I get to higher frequencies so that I'm not cycling through the samples at greater than the system sample rate, but it doesn't really make any difference. @taylor have anything to add here if you're not too busy? Insight on why it's not working? I find that if you run an aliasing waveform through the LFP node it sounds alright! @RobertSyrett I do run the waveform through an LPF at 2xHz and it doesn't appear to make any difference. I suppose I could run it at Hz, but the aliases don't sound like they are happening a very high pitch. This brings me to just how ignorant I am of basic DSP. My next attempt is roughly based on the article I linked to earlier. Because I believe part of the problem is getting partials that are past the nyquist limit as the pitch goes up, I have built 8 waveforms that have steadily dampened partials, and a mux node that selects between them automatically based on the input pitch. I *think* the results are better, but there is still aliasing. I've attached a sample patch that uses a theremin wave table and sounds pretty decent. I'm happy to explain my rationale further if anybody is interested. Ok, right after I posted I realized the glaring error in my code. I'm going to try to fix it and report back whether it fixed anything about the sound. I think I figured it out! I've attached a patch that actually sounds pretty decent. This one isn't the Theremin patch. I would love it if you could play with it and let me know what you think. My next step would be to design it to fit into the current ecosystem, and after that to build patches for all the Adventure Kid waveforms. Nery nice! I will have to get it up on my oscilloscope to see how the wavetable translates. Also I'm curious is there a reason why you couldn't crossfade the waveforms for smooth smoothness? I have imagined a scheme for a cross-fading mux node (engage cross fader when close to a cutover point, 100% individual wave table at other points) that would do just that, but this works for a prototype for now. To be honest, I haven't actually listened that closely to the patch.. just enough to tell if the aliasing is gone. Also, another improvement I might make is to scale my partial dampening logarithmically. My hope is it would still address the aliasing, but leave more partials intact for richer sound. I implemented a cross-fading mux8 node. It may be a bit overengineered.. hopefully I can figure out a simpler way to manage the crossfading. OK, discovered smoothstep and migrated to using it instead of my crazy arctangent function for the cross fading mux node. @jjthrash I guess you figured out that the docs are incorrect. It's smoothstep(a,b,x). I used for a x-fader on the linear zero-crossing FM oscillator I posted a while back. It comes in handy at times. @stschoen By the way, I figured out the parameters were mixed up after looking at your zero-crossing FM oscillator. I've seen it called "ease in/out"
In my case, I used it to drive the cross faders on my cross faded mux node. As the "sel" value approached the next step, it smoothly crossfades into the next step. How does it determine the rate at which it interpolates the step though? It seems like a slew but I must be missing something. I'll read the wiki article. The UI isn't final.. the variability of the text width leads to some wonky looking layouts, since these are all auto-generated. I changed them to be Octave-input instead of Hz input. No Sync input. Now I need to play with them.. There are 4357.. not sure where to start. I believe there's a problem with my WAV file reading. I coded it myself, so I shouldn't be surprised. Probably best to ignore the big patch dump above. :P Will try to fix it tomorrow. Time to start playing with them... Adventure Kid also has a set of NES sounds that I will probably patchify. Here's a low effort patch to make a bass guitar sound. This is awesome. Thanks man!